STAR ISLAND — A sleek, cypress-hulled craft cuts a famous wake as it cruises around Cass Lake. Tom Coen and his wife, Jennifer, of Star Island, refinished the woodwork on the 1920 Roamer, a launch the couple uses on Cass Lake. Tom Coen bought the boat with a partner in 1959 and took over complete ownership in 1960. The “Roamer,” an 87-year-old launch built by the Jos. Dingle Boat Works of St. Paul, is the prize launch of Tom Coen, a summer resident of Star Island in Cass Lake. Coen and a partner bought the boat for a few hundred dollars in 1959 from the Frank Anderson family, who also summered on Star Island. A year later, he bought his partner’s share. Tom’s wife, Jennifer, married into the Roamer in 1968, and wanted to sit beside her husband as he piloted the boat. So, Tom modified the captain’s chair as a park bench to seat two. Tom’s association with the Roamer goes much farther back in time. His grandfather acquired the property on the Star Island south shore in 1915 and built the family cabin. As a boy, Tom would see the Roamer cruising around the lake. In 1980, the Coens began celebrating the Roamer’s birthday every five years, always on the first Sunday in August. For its 85th in 2005, the guest of honor was Elsye McGuire, a passenger on the Roamer’s maiden voyage in 1920 when she was 11 years old. J.E. McBrady had ordered the boat from Dingle in 1919. It was delivered to Cass Lake by railroad the next summer. The McBrady family, of Evanston, Ill., was in the business of manufacturing pharmaceuticals and cosmetics, said Elsye, formerly of Cass Lake, currently living at Baker Park Apartments in Bemidji. “My dad took care of their cabin in the winter,” she said. At the time, Elsye lived with her family on Swenson Lake. The McBrady cabin was nearby on Lake Andrusia. “The day that boat came (to Cass Lake), it was my birthday, Aug. 20,” Elsye said. “We all got into my dad’s car to get the boat.” She said her father’s car, which she learned to drive, was a Dort, from a short-lived company that made cars from 1915-1924. 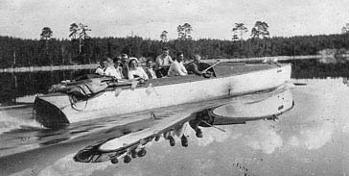 The Andersons bought the Roamer from the McBradys in 1928, and the launch has cruised Cass Lake ever since. “I had some restoration done on it in 2002,” Tom said. That was the first time the boat was on a trailer traveling over the road, he said. He said Tom Juul of Evansville, Minn., did the restoration. Tom and Jennifer refinished the native white oak and cedar decks and paneling. Their goal is to keep the boat as close to the original as possible. He said when the Roamer was launched in 1920, it had a canvas fold-down top. The Andersons asked Dingle to design a more weatherproof roof in 1934. Arnie Larson Boat Works of Cass Lake used that design to renovate the Roamer with the hard top it now wears. “That’s when the new engine was put in, in 1934,” Tom said. The Roamer still runs on its 1934 engine, which Tom had overhauled in 1968. “I change the spark plugs now and then, clean the carburetor,” he said. “They made things to last in those days.” The boat also has its original glass windows with hand cranks to raise and lower them. Tom has furnished the Roamer with a few period accessories, such as an antique brass fire extinguisher. “I’ve got one that really works, too,” he said, indicating the modern device strapped under the captain-and-mate’s seat. 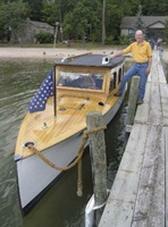 Tom and the Roamer are members of the Land of Lakes Antique and Classic Boat Society. He said Roamer is the launch’s original name, but he doesn’t know the derivation. “There were a lot of these launches — long, narrow boats — on Cass Lake in the ‘20s,” he said. The Roamer is the last one.